Powers/Abilities: Each Brother Royal presumably possessed a genius intellect in various scientific and technological fields. Like most Badoon, they likely had enhanced human strength, though in the case of the (apparently) aged individual involved with the Coterie, it had probably weakened with age over time. The Brothers Royal lead and command Badoon armies using advanced technology such as energy projecting blasters. These blasters had a nearly infinite charge due to the existence of a large generator. If needed, a self-destruct mechanism in the generator could be activated by the Brother Royal, effectively making it an enormous bomb. He had a small, elite guard of Badoon warriors known as Hunters that used such blasters and also wore battle armor. When engaged in battle, the Brother Royal used the same armor and blasters. He also used a hulking creature know as the Monster of Badoon. One Brother Royal had access to the technology of the Shi’ar stargate. They also have used holographic projections for communicative purposes. History: (Avengers Forever#10 (fb) / Silver Surfer I#2 - BTS) - Immortus met with the Brother Royal of the Badoon, telling him that humanity might be more powerful than the Badoon, and goading him into directing an assault against Earth. This attack was foiled by the Silver Surfer. (Silver Surfer I#2)- The Brother Royal of the Badoon led his people in a bid to conquer the Earth, landing his ship right over New York City, but shielded from human eyesight or technology by a cloaking device. The Silver Surfer however could see the ship, and entered it. 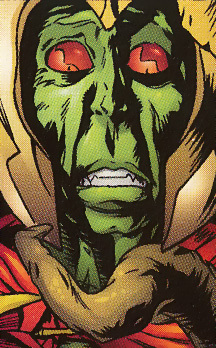 The Brother Royal tried to deceive the Surfer into believing them to be a peaceful race wishing only to help mankind, but before the Surfer could make any judgments, a young woman whom the Badoon had kidnapped alerted the Surfer of the Badoon treachery. The Brother Royal quickly shot this young woman, and would have killed her if it were not for the Surfer’s power cosmic. The Brother Royal then took a stroll along the streets of the city, being cloaked by his technology so that he may observe the race he intended to conquer. Coming to the conclusion that it would be an easy task to conquer humanity, the Brother Royal launched some pre-emptive assaults on the Surfer for sport. After sending out rockets, which the Surfer avoided, the Brother Royal ordered that the Monster of the Badoon (a giant, superhumanly strong robot) be sent out against the Surfer. The monster was also cloaked, and as the Surfer fought it, it appeared to the humans as if he were destroying the city. The Surfer defeated it, and the Brother Royal rescued it and then ordered a retreat, afraid of the Surfer’s power, and thinking that their invisibility had failed them, as humans fired rockets in their direction. (Sub-Mariner I#51)- The Brother Royal and the Brotherhood of Badoon allied themselves with Namor’s treacherous cousin Prince Byrrah in an attempt to conquer Atlantis. Byrrah had bribed the Badoon with the promise of Atlantean oil, but the reptilian aliens betrayed and shot him, wounding him, at which point Byrrah released his army of radioactively mutated crabs against the Badoon troops. As the aliens were distracted fighting the voracious crustaceans, Namor set off an explosion that killed both the Badoon soldiers and the mutant crabs, as well as destroying their coveted oil. Byrrah survived his injuries and escaped. Brother Royal and the Badoon left Earth in the face of yet another shameful defeat. (Uncanny X-Men Annual#5, (fb, BTS))- The Brother Royal and the Badoon received the dimensional and space spanning stargate technology from Shi’ar traitors in exchange for an attack against Earth by Badoon forces. Once the Badoon invaded Earth by surprise using the stargate to teleport on Earth’s surface rather than risk an easily detectable air attack, the Shi’ar traitors would initiate a coup d’etat against the Shi’ar Empire’s ruler Lilandra. (Uncanny X-Men Annual#5)- Using the newly procured stargate technology, the Brother Royal led an army of Badoon forces into the extra-dimensional realm Polemachus, which would be the staging ground for the planned invasion against Earth. Catching the natives of Polemachus by surprise, the Brother Royal and the Badoon captured Polemachus’ capital city and ruler Arkon in their initial attack. In a matter of weeks all of Polemachus’ once beautiful but now charred and battle-scarred cities were in the possession of the Badoon’s webbed, scaly talons. Those not slain by the Badoon either turned traitor and allied with the invaders, were enslaved, or fled into the desolate Wildlands, regrouping for a counter-attack under the auspices of Arkon’s warlord. Also in the Wildlands, the Badoon constructed their main base and permanent Earth-bound stargate machinery, while the Brother Royal set up his headquarters in Arkon’s palace, imprisoning and torturing Palemachus’ fallen leader within its walls. The Badoon also built an enormous generator in the catacombs beneath the palace to power their energy weapons and sealed it off. The Brother Royal initiated a torturous interrogation process upon Mr. Fantastic, hoping to glean information about the nature of Earth’s numerous superhuman being from him in the process. However, the X-Men and Invisible Girl came to Polemachus, and Storm and the Invisible Girl, disguised as slaves, gained entry into the Brother Royal’s base. Upon entering the Brother Royal’s main chamber, the Invisible Girl saw Mr. Fantastic being tortured, and, enraged, she belted the Brother Royal with an invisible barrier. Simultaneously, other forces rose against the Badoon occupiers all across Polemachus. Alongside Arkon’s warlord’s wildland army, several X-men attacked the Badoon’s stargate staging base, while other X-Men made a direct assault against the Brother Royal’s forces in Arkon’s palace. In response, the Brother Royal dispatched his elite Hunters plus the Monster of Badoon, donned battle armor, and armed himself. After some struggling, the last remaining Hunter reported to the Brother Royal that the stargate had been destroyed and that their forces were hard-pressed for help. The Brother Royal killed this messenger of ill tidings and remained confident that the Badoon would prevail as long as the sealed generator remained intact. Coming to the same realization, the Fantastic Four and the X-Men moved to destroy the generator. Making it to the generator, the two teams were greeted by a holographic image of the Brother Royal, which informed them that the generator would shortly self-destruct, atomizing Polemachus and everything on it. Using his superior intellect, Mr. Fantastic successfully directed the assembled heroes to combine their powers to shut down the generator without having it explode. Attempting to escape following the deactivation of the generator, the Brother Royal was killed by Arkon’s warlord. All of the other Badoon were slain, as well. Polemachus was liberated, and soon after all rejoiced in celebration. (Guardians of the Galaxy#30-33) - The next Brother Royal to lead the Brotherhood of the Badoon found his empire under assault by members of the Guardians of the Galaxy, who hoped to alter their own timeline's history by overthrowing the Badoon in the 20th century. However, the Brother Royal had a powerful ally-- L'Matto, a Badoon empowered by the Uni-Power to serve as Captain Universe. The Badoon defeated the Guardians, and Brother Royal set L'Matto upon Charlie-27 in a gladiator ring, during which L'Matto cut Charlie-27's throat with a dagger Yondu had given him. L'Matto was ultimately defeated by Dr. Strange and Starhawk, and Starhawk warned the Brother Royal to abandon his schemes to conquer Earth. He agreed, but made a point of recovering Yondu's dagger for future plans. (Guardians of the Galaxy#46) - Aleta and Starhawk, time and dimension travelling, soon destroyed the dagger just after the Brother Royal managed to lift it out. (Contest of Champions II#1 - BTS) - The Brother Royal secretly allied himself (apparently at the urging of the Badoon Directorate) with the Brood and their Imperiatrix, one of the highest-ranking Brood Queens. Posing as a group called the Coterie, they set up a "Contest of Champions", ostensibly to determine who was the most powerful among the many super heroes of Earth. However, their true goal was to avenge their many defeats at the hands of those selfsame heroes. They devised a form of nanites that could control he heroes, forcing them into violent contests, with the victors becoming hosts for the Imperiatrix' eggs. Brother Royal assembled a large staff of Badoon warriors and Elite Shock Troopers, and traveled to earth with the Brood Imperiatrix aboard her Acanti starship. (Contest of Champions II#1)- After all of the super heroes had been abducted from earth to the Brood ship, Brother Royal and the Imperiatrix were informed that all was ready, with one slight problem: Iron Man's sealed armor protected him from the nanite infection. The Imperiatrix ordered Brother Royal to make sure Iron Man was taken out quickly. However, Iron Man won his first bout, despite the Brother Royal's "favorable auguries", and the Imperiatrix made it clear that any failure on the Badoon's part would be "most unpleasant". The Brother Royal then assured her that his word was his bond, Iron Man would fall, and he did to X-Force, much to Brother Royal's relief. (Contest of Champions II#2)- Brother Royal interrupted the Imperiatrix' meditation with the news that Shadowcat's powers were inhibiting the function of the nanites, at which the pair confronted the horrified heroine with the truth of the "Contest of Champions". (Contest of Champions II#3)- Brother Royal learned that the Scarlet Witch's hex bolts were "punching holes in the fabric of causality", altering the local space-time continuum, and endangering their plans. Brother Royal angrily mused on how the Directorate had ignored his warnings against the endeavor in their blind rush for conquest and that now the most important effort was in survival. Knowing that the Imperiatrix would not agree with his cautious views, he began to secretly plot a way to betray his erstwhile ally while keeping his green skin intact. (Contest of Champions II#5)- As the heroes began to break free of the nanite control Brother Royal decided to cut his losses and flee aboard his personal barge, after setting the Acanti's systems to self-destruct. Naturally, he neglected to inform his Brood allies of their ship's impending destructing, wishing to avoid the Imperiatrix' wrath. Feeling safe after the vessel was destroyed, Brother Royal began a report to the Directorate detailing the venture's failure and his narrow escape with his Command Cadre, only to learn, to his terror, that the Imperiatrix had survived, and was aboard his ship. "Fortunate for us both, Brother. For I have need of hosts to rebuild my clan. And for your betrayal, I have need of vengeance!" After that, only the Brother Royal's tortured screams could be heard. Comments: Created by Stan Lee, John Buscema and Joe Sinnott. It was suggested at the end of the Contest of Champions that the Imperiatrix devoured the Brother Royal, but it was not directly shown. Byrrah, the Atlantean prince who allied himself briefly with the Badoon, was later killed by the agents of Suma-Ket. And, speaking of Atlanteans, Prince Namor wasn’t among the heroes assembled for the second Contest of Champions. Perhaps they couldn’t replicate his needed aquatic environment. The Nanites were placed in both food and drink in an attempt to infect Iron Man, so they could survive submersion in liquid. The Imperiatrix was recognised by both Kitty Pride and Psylocke as The Great Mother, a powerful Brood Queen who had apparently died way back in Uncanny X-Men#166, she was not the Brood Empress, as I had mistakenly stated originally in this profile. The unnamed Shi’ar traitor that provided the Badoon stargate technology in Uncanny X-Men Annual#5 is more than likely Deathbird, as her Official Handbook of the Marvel Universe entry states that she was a Badoon collaborator. John McDonagh added the Guardians of the Galaxy#46 appearance. Brother Royal’s Barge was evacuated to by the Brother Royal and his Command Cadre after setting the Imperiatrix’ ship to self-destruct. However, somehow the Imperiatrix escaped and took the over the ship, using he crew as hosts for her eggs, and sending the Brother Royal to an undoubtedly worse fate. A Brother Royal formed alliances with Byrrah and Deathbird, and engaged in attempted conquests of Earth and Polemachus. His conquest of Polemachus was thwarted by the X-Men and Fantastic Four, and he was slain by Arkon's warlord. The succeeding Brother Royal allied himself with the Brood, and set L'Matto against the Guardians of the Galaxy. After helping the Brood Imperiatrix create the "Contest of Champions" scam, he wound up being devoured by her for abandoning the Brood.